Discover campsites of Rhône-Alpes France but also over 450 campsites throughout France, offering a variety of rental mobile homes, chalets and accommodation of more atypical as bungalows or caravans, but also leisure facilities such as aquatic areas with sometimes an indoor or well even with heated pool for your comfort, for an unforgettable vacation. Campsites in Rhône-Alpes welcome you to your camping holiday 2, 3, 4 and 5 star or LRP. 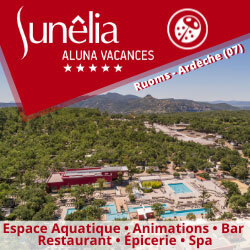 Campsites with recreational facilities (swimming pool, water park, water park, water slides, wading pool, spa, playground, tennis court, multi-sports), entertainment and services (restaurant, bar, food, WiFi access, disabled access, camper services) to make the best of holidays throughout Rhône-Alpes. 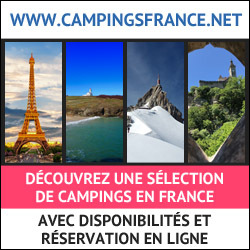 Traditional camping in Rhône-Alpes on pitches or rental of mobile home camping, campsites below offer the best camping in Rhône-Alpes. Enjoy the outdoor accommodation and campsites in Rhône-Alpes! Rental of mobile homes, chalets, bungalows, cottages, Bengali, cottages, trailers, caravans, tipis and camping sites equipped for your holidays in Rhône-Alpes, our French campgrounds welcome you everywhere in Rhône-Alpes, a favorite camping in Europe. Have a great holiday camping with our campsites in Rhône-Alpes! Ludo and Ria welcome you on their calm family camp site « Les Bords du Guiers ». The campsite is located 200 meters from the center of St Genix sur Guiers on the riverside of the river “Le Guiers” between lakes and mountains in the Savoy. On site we have a swimming pool, play ground, table tennis, volley ball and petanque. In the area you will find multiple for bicycle and walking tracks adopted for the whole family. At the reception, you will find a restaurant with a small menu, snack bar and every morning we have fresh bread and croissants or you can take your breakfast. We can also advise on the interesting sites to visit in the region and help you with sportive and water activities in the area. The campsite le Vaugrais is a familial site, situated next to Aix les bain, and the lake of Bourget. 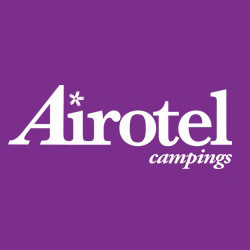 For your holidays, we purpose cottages, big pitches for your tent or your caravan, or your camping-car. You can pratice a lot of activities : canoe, canyoning, climbing, fishing,swimming in the lake. The swimming pool is open from juny until to september. Wifi is in all the campsite. A l'entrée des Gorges de l'Ardèche, 30 km de Vallon Pont d'Arc et 1 km du village de St Martin d'Ardèche, nous vous proposons des emplacements de 100 m² et la location de Mobil Homes 4 à 6 pers.